We all know the Lancaster – the real heavyweight of the RAF’s campaign over Germany and the occupied nations of western Europe. 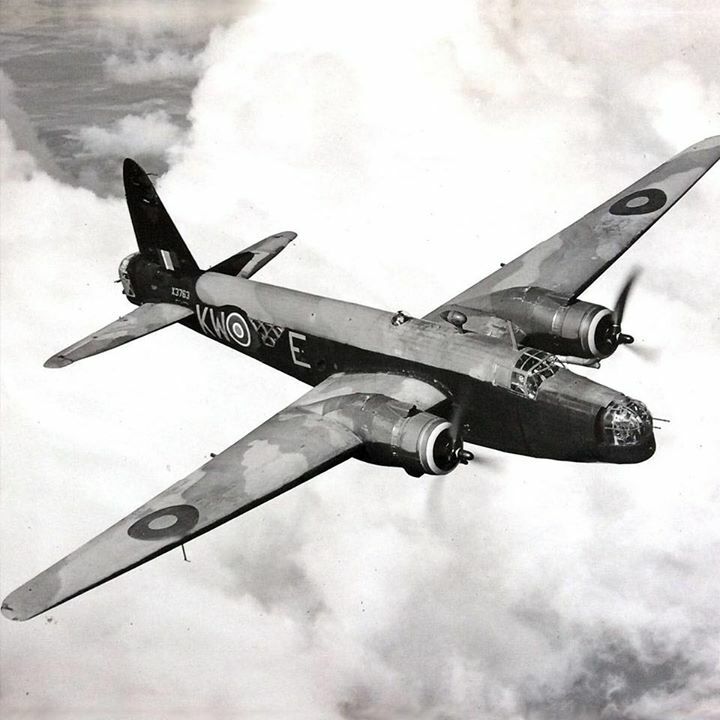 As Britain celebrates the centenary of the world’s first independent air force, we should also remember the very different Vickers Wellington, which outnumbered even the Lancaster; was produced before, during and after the war; and bore the stamp of an individual genius like very few other aircraft have ever done. There are few more venerable or significant names in the tortuous corporate history of British engineering business than Vickers and Armstrong. Vickers was founded in Sheffield in 1828, to cast high quality specialist steel. 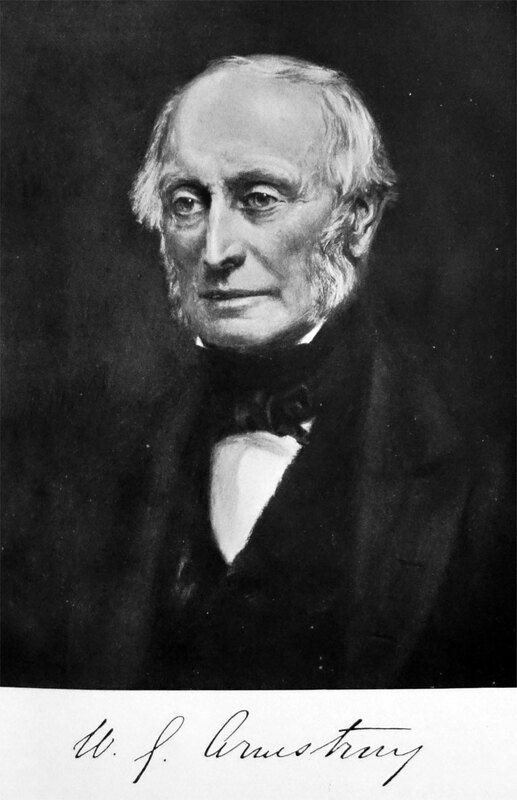 William Armstrong (1810-1900) founded his armaments, cranes and hydraulics business in Newcastle upon Tyne in 1847, and then merged with rival Joseph Whitworth (the inventor of the British Standard Whitworth screw thread) in 1897. By 1927, when the two businesses merged as Vickers-Armstrongs, it produced armaments (the British Army’s standard was the Vickers machine gun; the Royal Navy favoured Armstrong’s naval guns), and the tanks and ships to carry them; – here, the battlecruiser Hatsuse, built for the Japanese Navy at Armstrong’s famous Elswick Works in Newcastle, passes through Armstrong’s iconic swing bridge over the Tyne between Newcastle and Gateshead, en route to the North Sea and the Far East in 1900. But there was more – steam locomotives for Britain and abroad; submarines from the Vickers yard at Barrow in Furness – now the only site in Britain capable of building the Navy’s subs; and cars – Armstrong Whitworth produced cars under its own name, and Vickers owned the Wolseley company, where Herbert Austin began his engineering career, designing sheep shearing machines in Australia, before he turned to cars. Both car businesses were sold in 1928, to the aviation and motoring entrepreneur J D Siddeley and the then dominant William Morris respectively, who made Wolseley his premium brand, in modern speak. And there were planes. Both Vickers and Armstrong had aviation businesses. 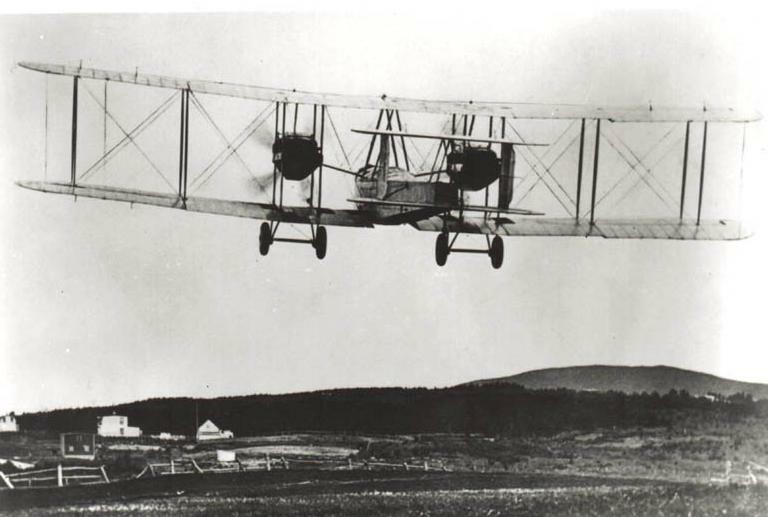 The first plane to fly the Atlantic non-stop was a Vickers Vimy bomber, flown by RAF veterans John Alcock and Arthur Brown in 1919. 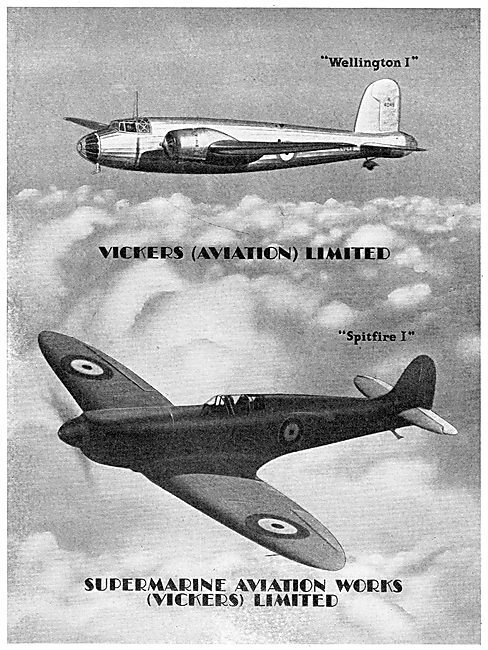 The Vickers aviation business was retained, as Vickers-Armstrongs; by 1930, it also included the Supermarine company, of Spitfire fame. 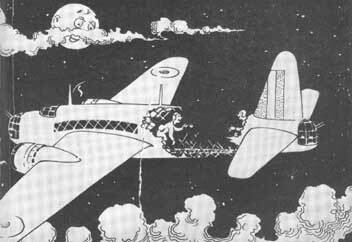 The Armstrong-Whitworth aviation business was sold to Siddeley, and became part of the Hawker group by 1936. So there were two competing aircraft companies, both inheriting the Armstrong name; not surprisingly, they became better known as ‘Vickers’ and ‘Hawker Siddeley’. Confused? You will be! 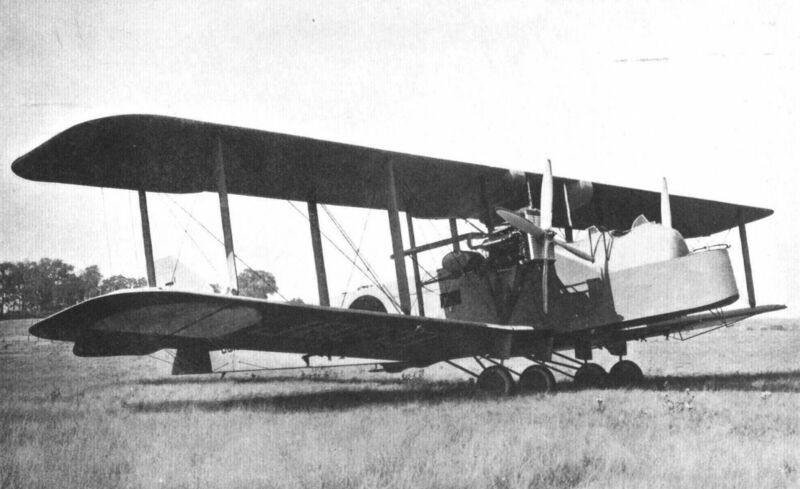 In 1932, the RAF issued a specification to the British aircraft manufacturers, for a twin engine medium bomber capable of greater performance than the air force’s largely biplane existing fleet, such as the antiquated Handley Page Hyderabad. And both Vickers-Armstrong and Armstrong Whitworth were among those competing for the business. Three designs made it in to production from this specification. The Handley Page Hampden used Bristol Pegasus radial engines, and featured an almost fighter like fuselage just 3 feet wide for speed and agility. Bombload was only 4,000lb, in an very inflexible bomb bay – a consequence of the cramped size. Over 1,400 were built, before it ended its Bomber Command career in 1942 as the Halifax began to stream out of Handley-Page’s factories. The Armstrong-Whitworth Whitley was named after the factory near Coventry where it was built, which was later used by Rootes and is now (much developed and rebuilt) Jaguar’s headquarters and engineering centre. A semi-monocoque fuselage and Armstrong-Whitworth’s own Tiger engines allowed a bombload of up to 7,000lb, but performance was soon shown to be too slow. 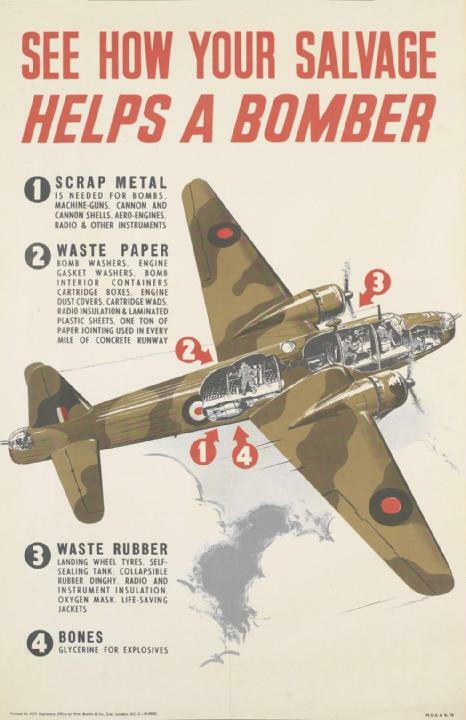 The Whitley has the distinction of being the first British bomber of the war to fly over Germany – dropping propaganda leaflets on 3 September 1939. In all, 1,800 were built, and many had a second career as glider tug and paratroop transport, after their frontline bombing role ended in 1942, but all had left RAF service by early 1944. 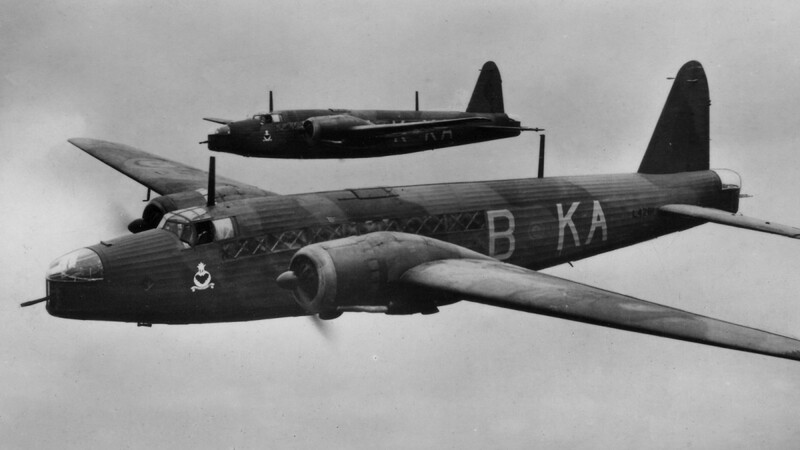 But one of these medium bomber designs did see out the war with Bomber Command – the Vickers-Armstrong Wellington. In fact, it was the only British bomber to serve right through the war, and to be produced before, during and after the conflict. And it was a ground-breaking design, from an engineer who loved breaking new ground – Barnes Wallis. 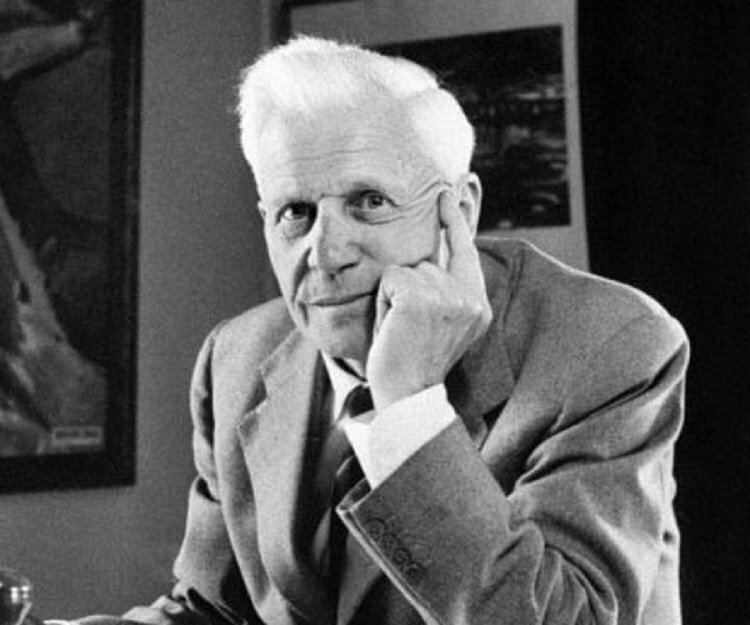 Sir Barnes Neville Wallis CBE FRS RDI FRAeS (1887-1979) worked for Vickers (and its nationalised successor, the British Aircraft Corporation) from 1913 to 1971. His early career focussed on the use of light alloys to replace wood in airframes, which led to an interest in airships in the 1920s. His R100 was designed to meet a specification from government under the Imperial Airships Scheme, calling for an airship capable of carrying 100 passengers for 3,000 miles (at 60mph!). The R100 was built to Barnes Wallis’ own design, rather than existing airship principles. Instead of a heavy frame of stainless steel, he used Duralumin (an alloy of aluminium and copper) for lightness, with the strength derived from the geodetic structure he devised. The structure is essentially a lattice that gives great strength, but also simplicity of manufacture. 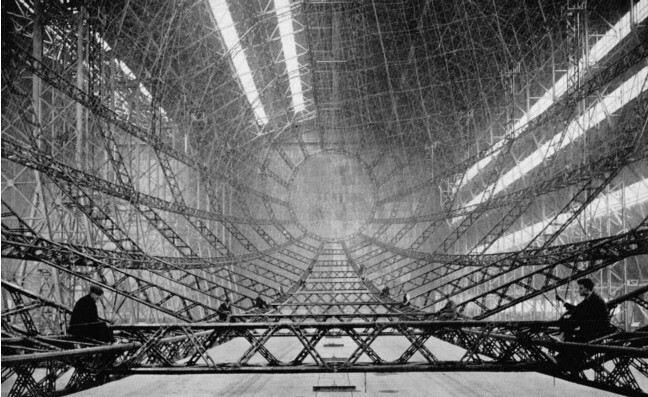 The R100, which was 700 feet long, had just 11 pattern of component in its frame. Meccano for grown-ups, perhaps. 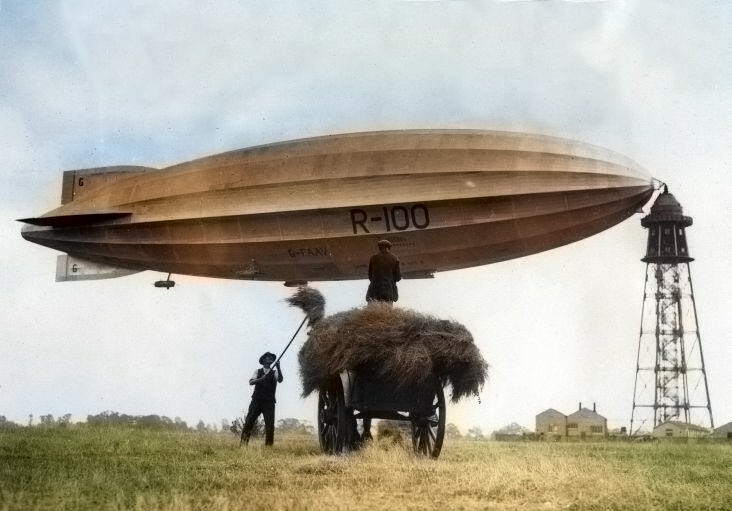 R100 succeeded in crossing the Atlantic to Canada in under six days in 1930, but the programme was curtailed when the rival R101 crashed in France en route to India, killing many of the engineers and political supporters of the airship programme. R100 never flew again, but Wallis was determined to use the geodetic concept again. He persuaded Vickers-Armstrong that a geodetic frame would work for a bomber, and his design quickly demonstrated its strength, allowing the power and bombload of the design to steadily increase, with a very adaptable bomb bay. The skeleton was composed of 1,650 pieces, which fulfilled its promise to give the Wellington its famous and exceptional strength and ability to absorb punishment from anti-aircraft guns and nightfighters. The skin was traditional stretched and doped fabric – probably the last British bomber with this form of skin. This wartime cartoon overstates it in typical British style, but you get the idea. The prototype Wellington first flew in June 1936; an RAF production order was 180 was placed in August the same year, such was the quality of the design and the urgency of the need, and the first production example was completed in November 1937. This was powered by the nine cylinder single row air cooled Bristol Pegasus radial engines, and production was quickly ramped up as the international situation deteriorated. 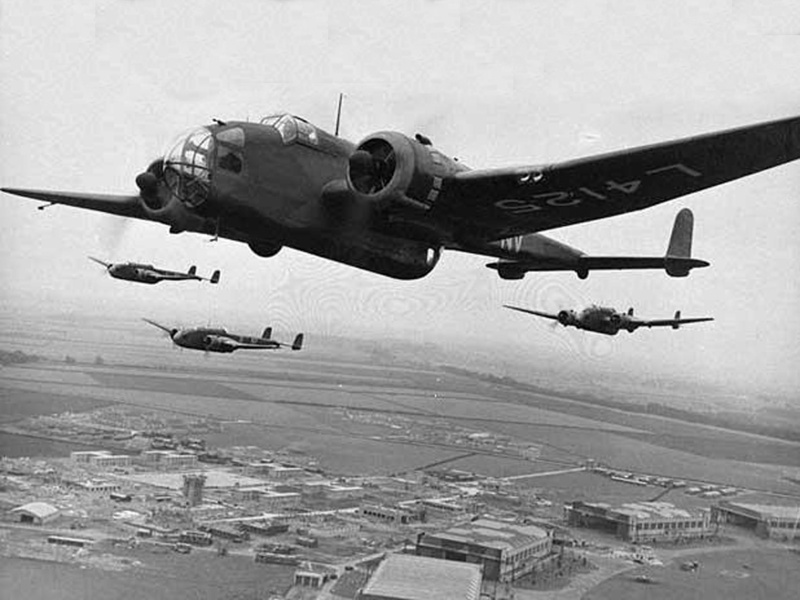 By the outbreak of war in September 1939, the RAF had ten active Wellington squadrons. The Wellington was 64 feet long, with a wingspan of 86 feet. It carried six machine guns, in pairs in nose and tail turrets, and in the waist of the fuselage. As with other British bombers, this level of defensive armament was quickly shown to be inadequate for daylight raids over Germany, pushing Bomber Command into night operations. The crew was six strong – pilot, navigator, wireless operator and three gunners – front (who doubled as bomb aimer), middle and rear. Production was quickly ramped up as the Wellington showed its superiority over the other twin engined bombers; by 1938, as well as Vickers, both Gloster Aircraft and, inevitably, Armstrong-Whitworth were producing Wellingtons for the RAF. 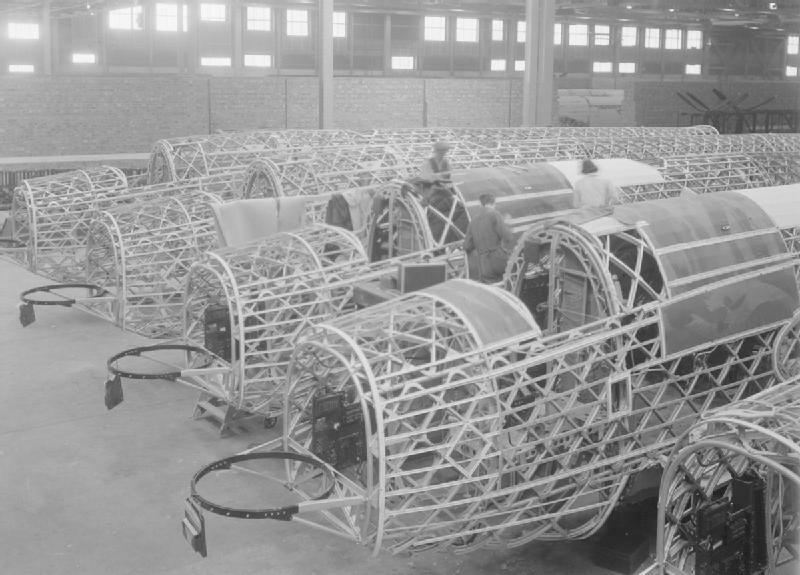 Production peaked at 300 per month in 1942, with most production at Vickers’ sites at Weybridge (site of the Brooklands racetrack and aerodrome) and Broughton, near Chester (now the home of Airbus’s wing manufacturing). The last Wellington, of almost 11,500, was built in October 1945. 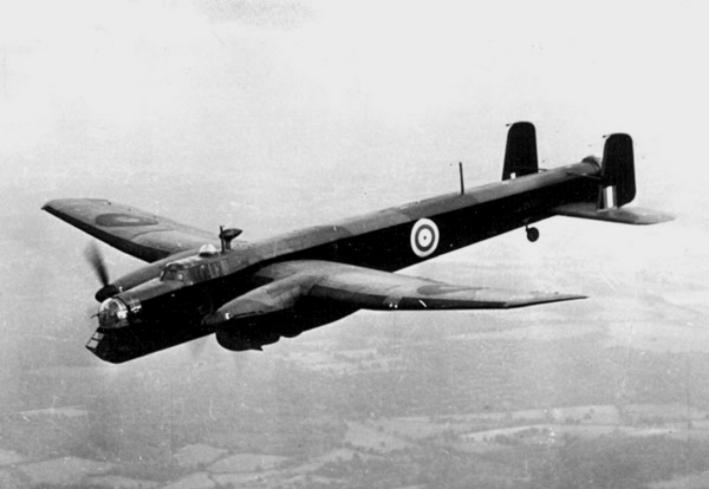 The Wellington holds the distinction of being the first British bomber of the war to attack Germany, with a raid on shipping at Brunsbuttel, where the Kiel Canal and the River Elbe meet the North Sea. But early wartime experience for Bomber Command was dispiriting. Daylight raids produced heavy losses, and night raids produced meagre results until the navigation and bomb aiming aids that made Bomber Command one of the most technically accomplished fighting forces yet seen began to appear from 1942 onwards. Symbolic of the new era was the first 1,000 bomber raid of the war, in May 1942, when 1,047 RAF bombers attacked Cologne (Koln) in one night – twenty tons of bombs a minute, according to the newsreels. 599 of the bombers were Wellingtons. 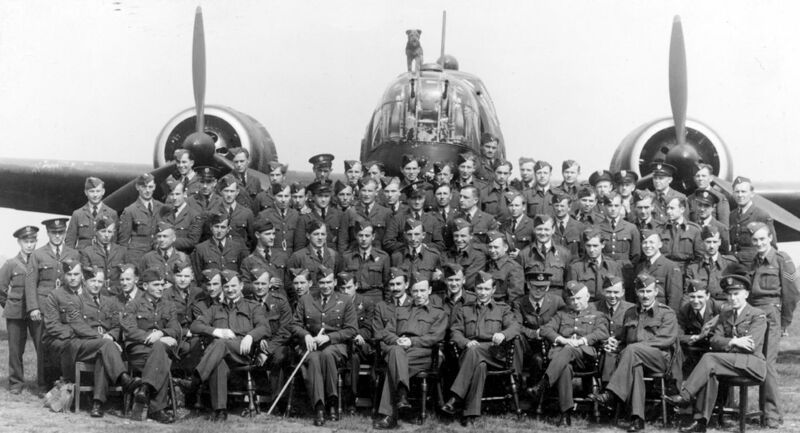 Like all Bomber Command flying crew, all Wellington crews were volunteers, from across the British Empire and the occupied countries of Europe. And remember that 70% of Bomber Command crew were killed, injured or captured – by far the highest rate for any of the Allied services. One episode from a Wellington sortie shows the risks these men faced, and the bravery they displayed. In July 1941, Flight Sergeant James Allen Ward, a New Zealander serving in a Wellington of 75 (NZ) Squadron, RAF, on a raid to Munster, climbed out on the wing of his plane, making handholds by tearing the wing fabric, to successfully extinguish a petrol fire caused by a German nightfighter in the starboard engine, and then safely made his way back inside the plane. He was awarded the Victoria Cross, Britain’s highest military decoration. And when he met Winston Churchill, he confessed to being awed by the Prime Minister’s presence. ‘Then you can imagine how humble I feel in yours’ replied Churchill. In October 1943, workers at Vickers’ Broughton site (albeit the site was managed by the Ministry of Aircraft Production) assembled a Wellington in 23 hours 50 minutes, from ‘first bolt to take-off’, and all filmed as part of the propaganda effort by the Ministry of Information. 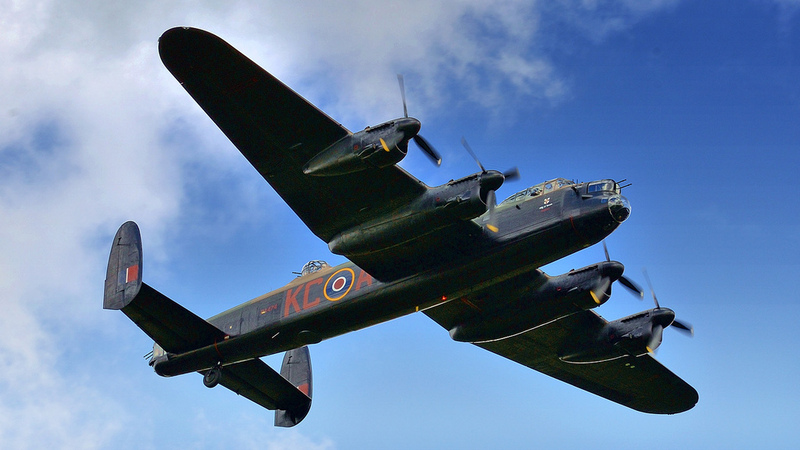 But by now, the Wellington was relegated from the frontline over occupied Europe, as the awesome but magnificent Lancaster and Halifax four engined ‘heavies’ poured out of the factories and onto the bomber bases of eastern England. 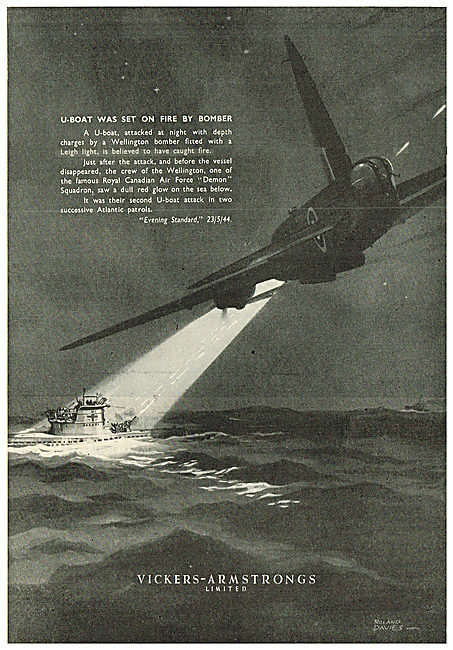 The Wellington found a new niche in Coastal Command, patrolling the sea-lanes of the eastern Atlantic and successfully attacking German U-Boats. Others equipped with a 48ft metal hoop below the aircraft were used to detect and explode enemy mines by magnetic field. It also starred in the North African campaign (many flown by the South African Air Force) and in the far east – it was the largest RAF bomber used outside Europe. 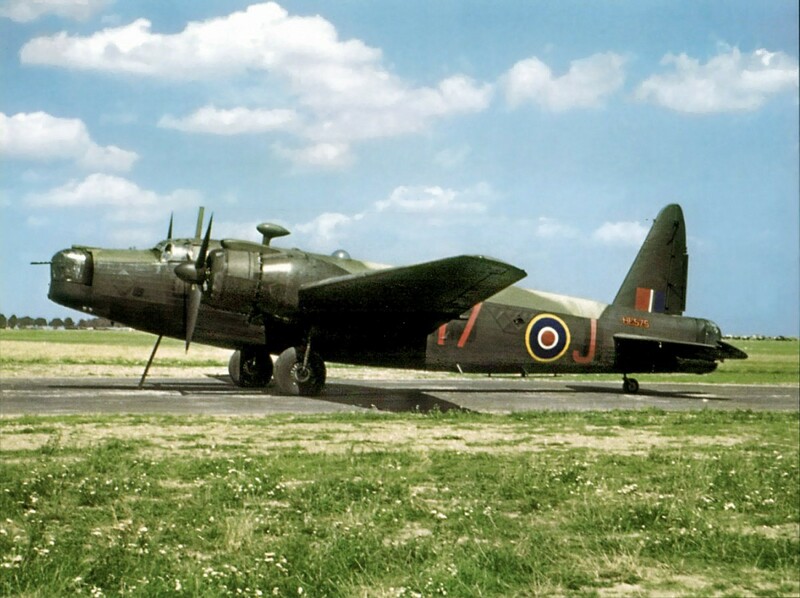 Unlike the Whitley, the Wellington was not suited to towing gliders – the longitudinal strain caused the geodetic structure to flex alarmingly. Gliders were left to the remaining Whitleys, and increasingly to the Douglas DC-3 Dakota, and the four engined but unsuccessful Short Stirling heavy bomber. 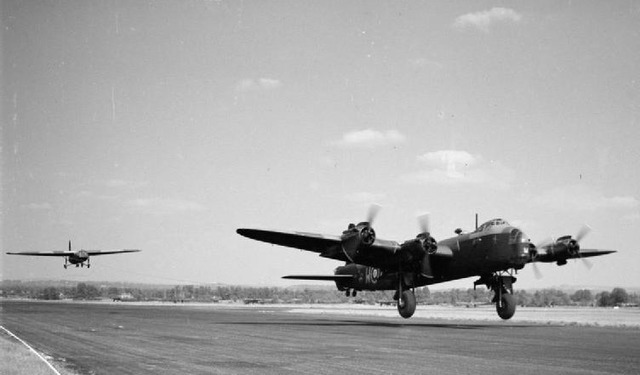 RAF Service ended in 1953; one of the Wellington’s last duties was as in flight camera plane for the making of the ‘Dambusters’ film, plus a bit part recreating the dropping of the famous ‘bouncing bomb’ – which was also designed by Barnes Wallis, of course. Two Wellingtons remain in Britain. One is at the Brooklands Air Museum, on the site of the factory where it was built in 1939; it then spent almost half a century in Loch Ness after a training flight crash in 1940. It completed 14 raids over Germany. The other is fittingly at the RAF Museum at Cosford, north of Birmingham. And why was the plane called the Wimpy by its crews? 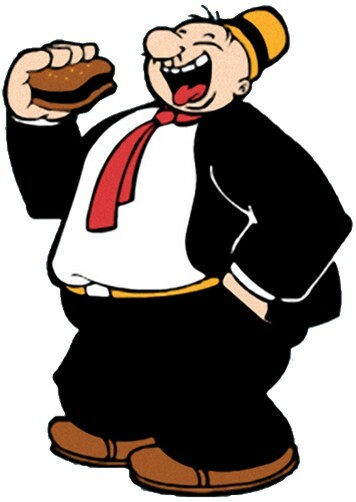 Wimpy Wellington from the Popeye cartoon, of course. Even with that 70% casualty rate, there was a funny side to one of the most significant aircraft in RAF history. And at last a fitting memorial to the men of RAF Bomber Command has been completed. Lest we Forget. Excellent overview! A Wimpy was one of the scale models I built as a kid – definitely the odd duck with its ‘cross-hatch’ rib pattern on the fuselage. Great article, thank you. My father was in the RCAF during WW2. As a kid, I used to enjoy staying up late during summer break, as he told me all about the Wellington and other allied aircraft. Great article- I learned a few things! Splendid! Not a plane I was very familiar with, but you’ve fixed that. I had no idea the “bouncing bomb” was invented by an aircraft designer, though it makes a lot of sense. I spent nearly 21 years in Naval Aviation but couldn’t tell you much about planes, other than the 3-4 different types I worked on. But watching more and more WW II movies has piqued my interest. One noteworthy point is that the Wellington flew faster and higher than the 4 engine bombers, so their crew survival rate was much higher since a Wellington was both hard to hit and harder to destroy than the Lancaster. 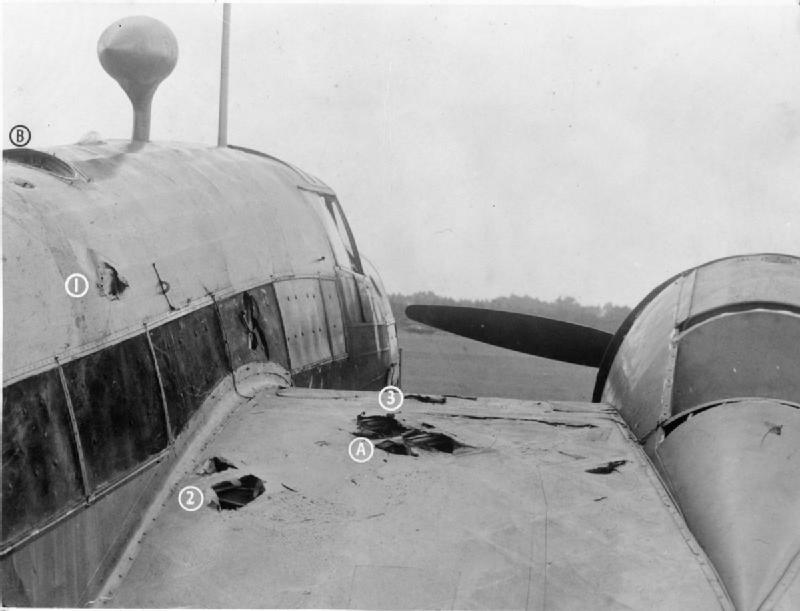 The Lanc also added insult to injury by being very hard to bail out of compared to other bombers.The Mosquito took this to the logical extreme, using an equally advanced construction technique and no defensive armament to achieve maximum performance for minimal use of resources. The Mosquito’s molded wood construction was an early form of composite construction similar to Rutan’s aircraft designs and with 2 engines, 2 aircrew and minimal use of aluminum it was a far less costly way to drop 4000 lbs. of bombs on Berlin. As a historical foot note, Barnes Wallis employed Neville Shute, the author ” On the Beach” as head of calculations on the R100 project. Shute went on to be co-founder of Airspeed and lead designer of the Airspeed Oxford twin engine trainer before emigrating to Australia and becoming a writer. They did of course produce Mosquitos armed with machine guns and canon eventually. You can view the wooden construction at the De Havilland museum in Hertfordshire. 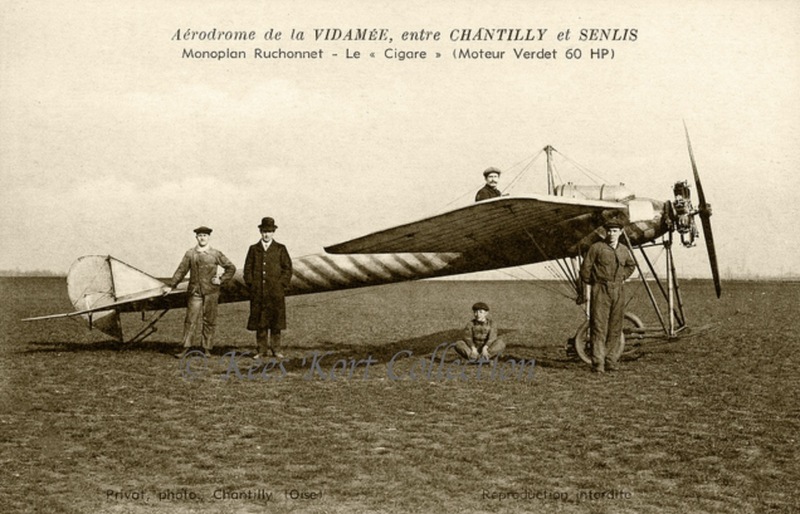 Eugene Ruchonnet is credited with the first use of monocoque construction in an aircraft, in the circa 1911 Cigare. The Deperdussin Monocoque, circa 1912, was the first aircraft to exceed 100 mph in level flight, also utilizing a monocoque fuselage construction. The WWI Albatros utilized a semi-monocoque construction for its fuselage… same idea, but with an internal structure to which the plywood shell was attached. Maybe someone should do a CC ( celluloid classic) on Popeye – he has a lot to answer for. Thanks for this, I hadn’t really known much about the Wellington. That geodetic structure sure looks like a lot of labor to put together correctly. I am sometimes sadly lacking in knowledge of things other than cars and your articles always make me feel that little bit smarter!? I also had a Welly in my 1/72 scale “air force”. Also grew up watching “One Of Our Aircraft Is Missing”, a WWII vintage Brit production about a bomber crew that bailed out over occupied Holland, evaded capture and returned to England. Their aircraft “B for Bertie” was a Wellington. 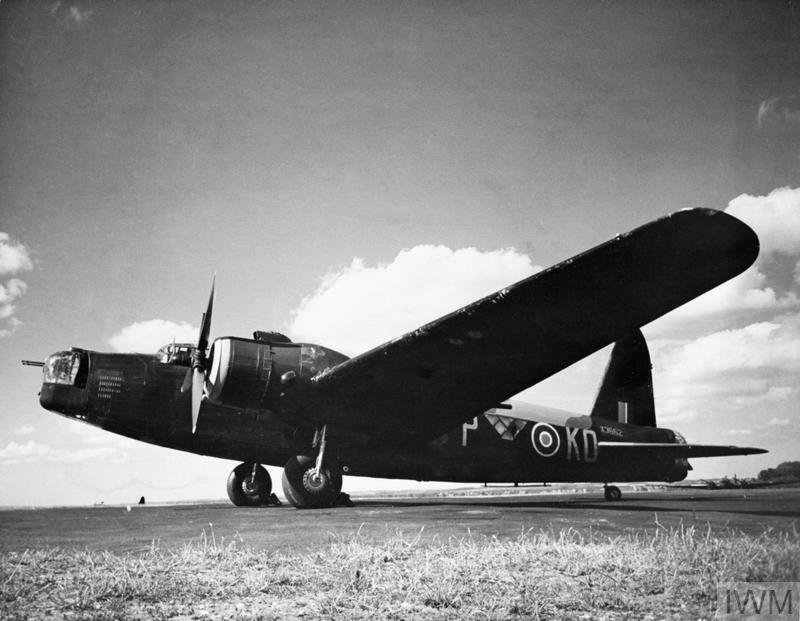 According to the Wiki entry, the RAF provided a real Wellington fuselage for filming interior scenes and all the footage except for during the attack is of real Wellingtons. Some thoughtful person has uploaded that film to YouTube. Great read. Pictures were first-rate as well. I can only recognise the Lancaster from my brother’s war comics, nice to have new shapes to peruse. And to have that Armstrong thing explained. That shot of the Airship frame is fantastic and the one of the burnt frame looks like the fossil of a giant prehistoric fish. I always enjoy these forays into things beyond cars, and your pieces on British aviation are always fascinating. I had no idea that a plane with a fabric skin was doing front-line duty in WWII. The ‘Stringbag’ was one. 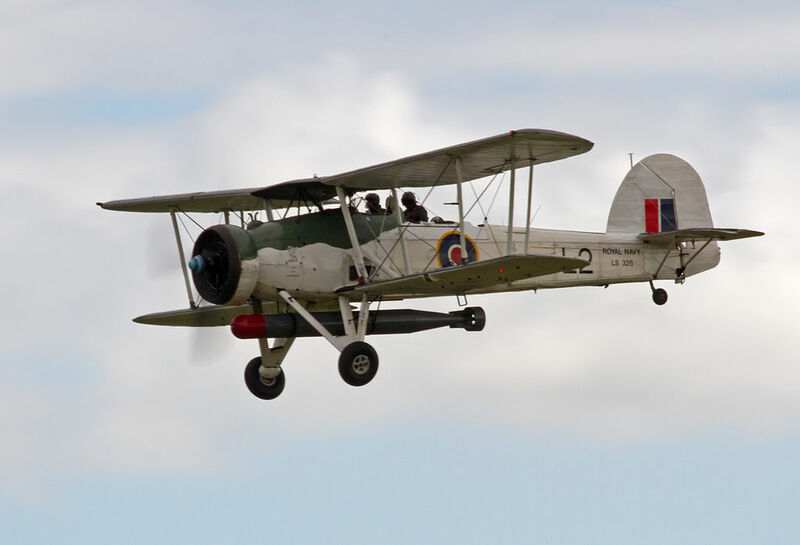 A fabric covered biplane torpedo bomber, the Swordfish was responsible for wrecking the steering of the Bismark, thus injuring her enough to allow the Royal Navy to corner her. 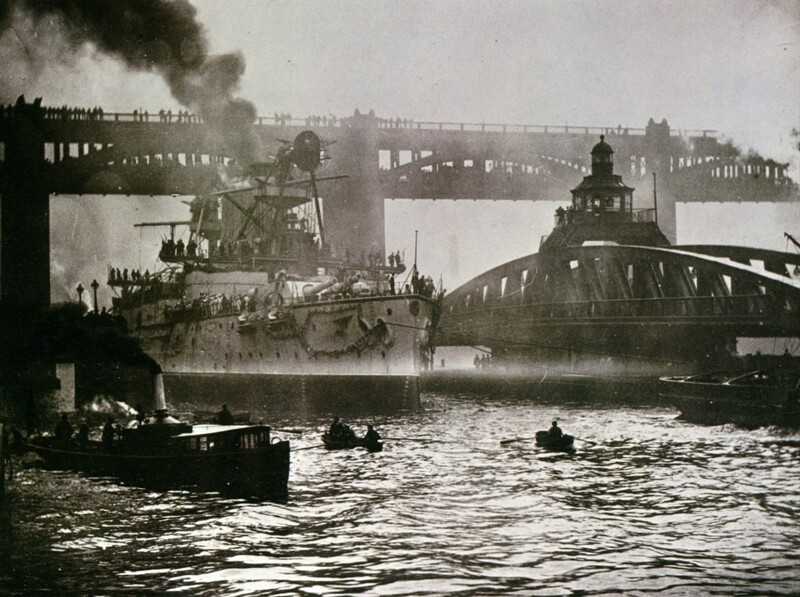 They also were instrumental in sinking half the Italian navy in one night at Taranto. Yet, Fairey’s design wouldn’t have looked out of place 20 years earlier. There were plenty of aircraft in WWII with at least partial fabric covering. The after fuselage of the Hurricane was fabric covered. Early marks of Spits had fabric covered control surfaces. 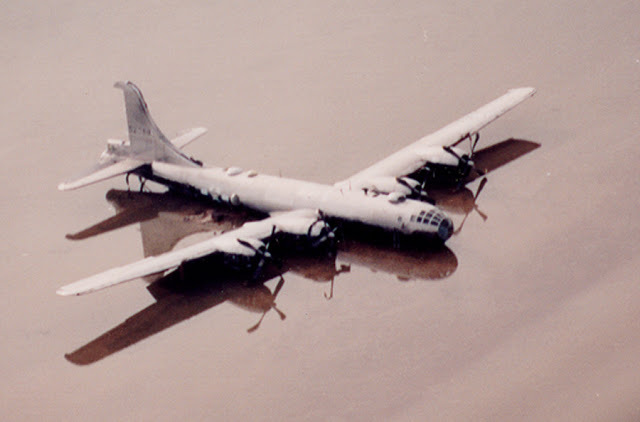 Even the technically advanced B-29 had a fabric covered rudder. This one crashed in Greenland and sat until a salvage attempt in the 1990s. The rudder fabric had entirely weathered away. Is this the plane that caught fire when they tried to rescue it ? Yes, that is the “Kee Bird”. Amazing. Two years trying to recover that plane, then they leave the APU running unattended as they taxi over very rough snow and ice, shake the APU lose, which spews fuel around and ignites it. Here’s a 10 minute edit of the documentary about it. Even though the first photo of the ‘Welly’is the real plane, it does look like a large Airfix scale model.I just love those huge tires! Great article, especial for us car buffs who also love aircraft. Great article! The book ‘It’s Dicey Flying Wimpys’ (Re released as ‘Out of the Italian Night’) gives a great first hand account of these aircraft and their crews on operations.